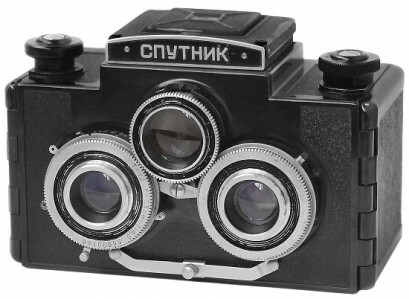 Shutter: 1/10, 1/25, 1/50, 1/100 + B.
PK1805 - An earliest Sputnik camera (1954). PK1805. An earliest so far known version of Sputnik camera (see picture above). Serial number with "54" (1954) date prefix on the lens. Different style of name markings. Never happened to see it alive. PK1807. 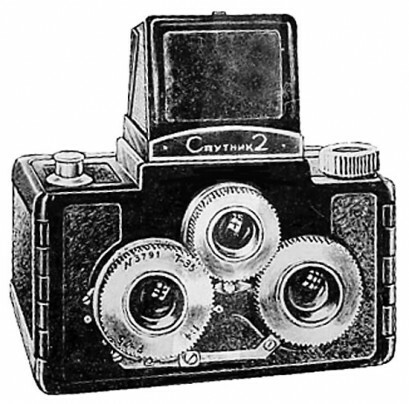 Camera identical to K1805, but with regular nameplate already. Still date prefix in serial number on the lens. An earliest so far known camera has s/n #55000166 (A.Nikitin coll.). Camera #55000166 opposite from Alexey Nikitin (Russia) collection. PK1810. Camera identical to PK1807, but without date prefix on the serial number already. 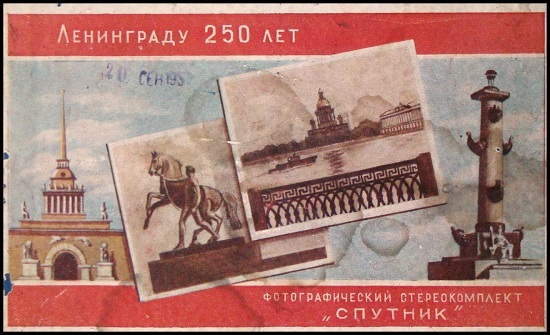 Markings in Cyrillic characters. 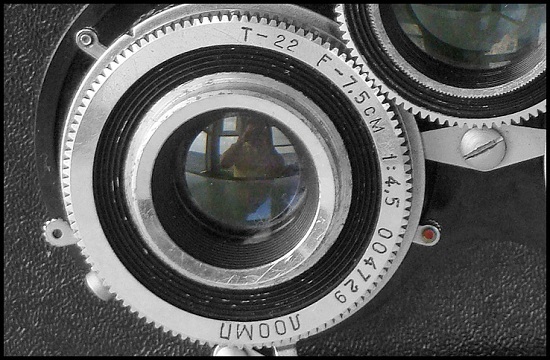 Old sequence of shutter speeds: 1/10s, 1/25s, 1/50s, 1/100s + B. GOMZ logotype on the top plate. Tripod thread on the bottom is 3/8'' (large one). 1 inch = 2.5 cm. 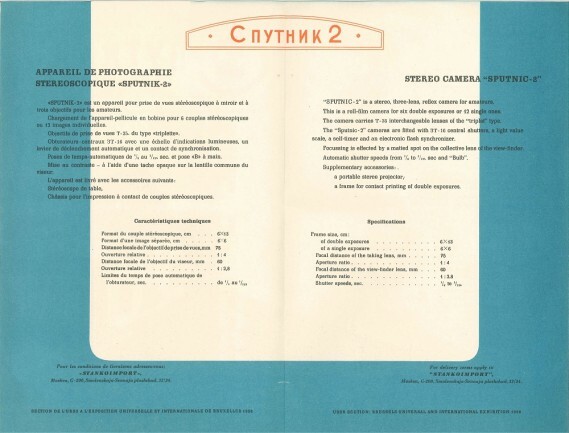 The particular camera opposite was found in nice commemorative box (see information below). Very interesting complete set of Sputnik camera. As far as I know only 2 GOMZ cameras - Leningrad and Sputnik have entered the market with special box to commemorate the "250th Birthday of Leningrad". PK1815. Some early 1st version cameras have lens markings and serial number on the right lens (authenticity not confirmed yet). No otherwise different from PK1810. 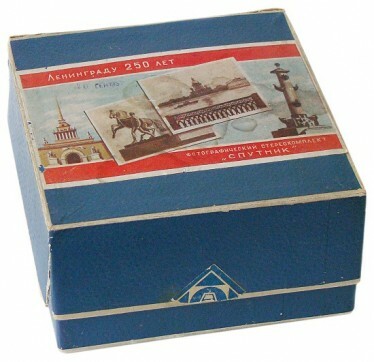 PK1810 - Anniversary box for Sputnik camera set. PK1820. Camera identical to Sputnik PK1810, but with new sequence of shutter speeds: 1/15s, 1/30s, 1/60s, 125s + B. Still GOMZ logotype on the top plate. Tripod thread still 3/8''. PK1822. Very uncommon to find export version of the particular camera. 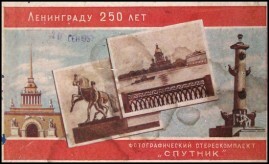 "SDELANO B CCCP" in Cyrillic characters engraved on the back door's lock. No otherwise different from K1820. Known camera has s/n #079700 (D.Spennemann coll.). PK1825. Very uncommon version of Sputnik, released in 1963-1965. New sequence of shutter speeds: 1/15s, 1/30s, 1/60s, 125s + B. Top plate is blank, but there is "LOOMP" logo on the lens frontplate. Tripod thread 3/8''. The particular camera #004729 comes with export markings in Roman characters. PK1830. Quite common camera to find. 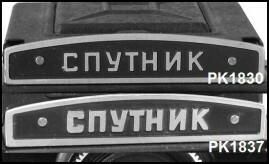 Markings in Cyrillic characters. New sequence of shutter speeds: 1/15s, 1/30s, 1/60s, 125s + B. Top plate is blank, but there is "LOMO" logo on the lens frontplate. Tripod thread still 3/8''. PK1835. Camera identical to PK1830, but with smaller 1/4'' tripod thread already. PK1837. 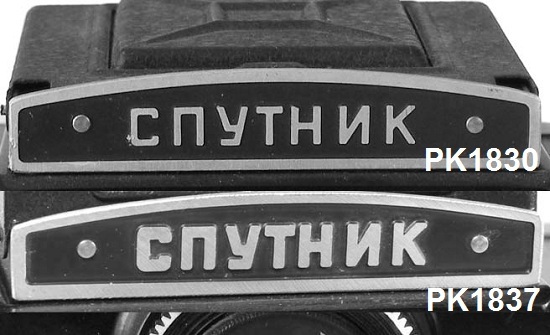 Camera identical to PK1835, but with thick name markings now (see picture below). 1/4'' tripod thread. 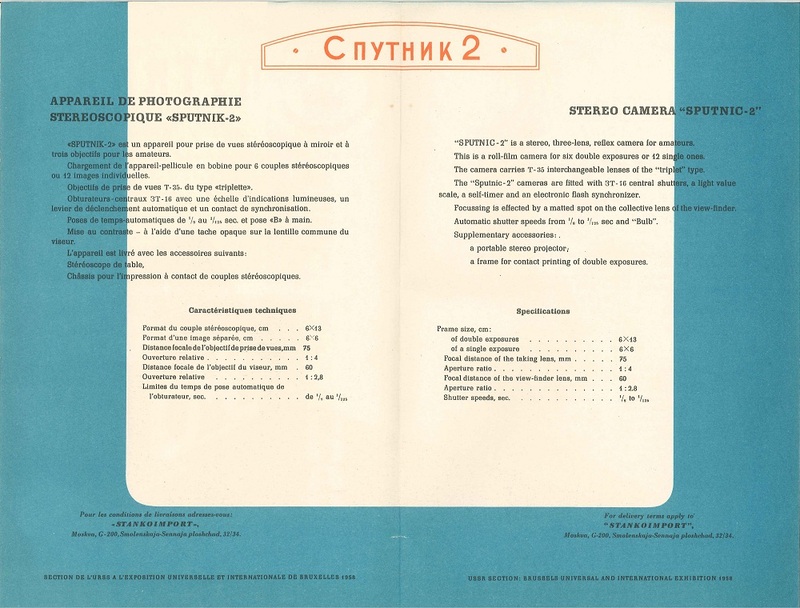 An earliest so far known camera has s/n #002621 (A.Nikitin coll.). Camera #003145 opposite from Istvan Csabai (Hungary) collection. PK1840. Camera identical to PK1830, but with export markings in Roman characters. Tripod thread on bottom plate still 3/8''. "Made in USSR" engraved on the back door's lock. Less common to find. No otherwise different. PK1845. Camera identical to Sputnik PK1835, but with export markings in Roman characters. Tripod thread on the bottom is 1/4'' already. "Made in USSR" engraved on the back door's lock. Less common to find. PK1850. 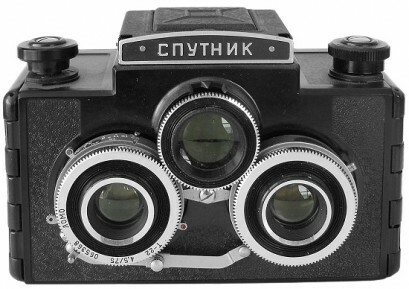 Rebadged Sputnik camera, under export name "Dural". Very rare to find camera. Never happened to see one alive. Shutter: 1/8s - 1/125s + B.
PK1870. 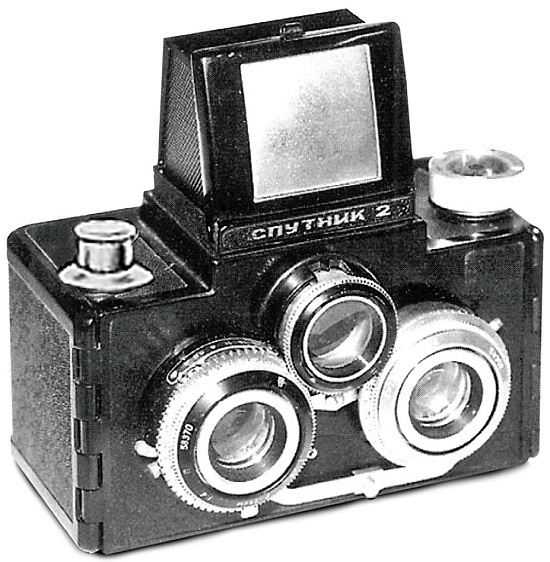 Prototype camera "Sputnik-2" was announced at "Brussels Universal and International Exibition" in 1958. Unfortunately only few exibition leaflets as evidence of this camera existance are known to exist until now. Never happened to see this camera alive. Sputnik-2 camera's leaflet below from Alexander Kneller (Germany) collection. 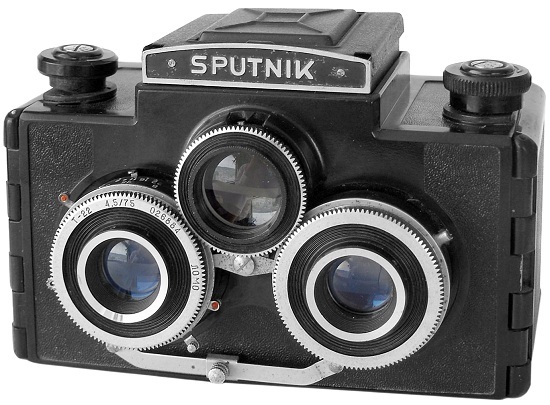 PK1870 - Sputnik-2 prototype camera. 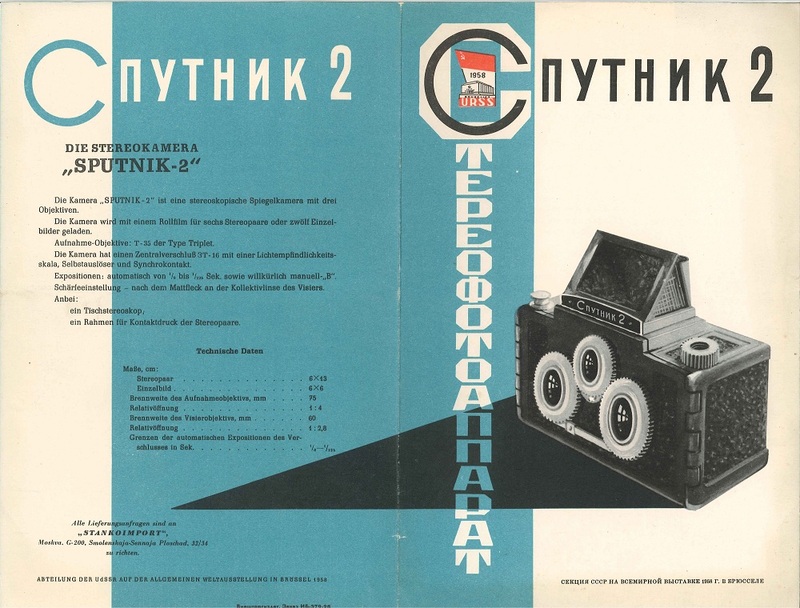 PK1870 - Sputnik-2 camera leaflet. PK1875. Another prototype version with slightly changed body design. 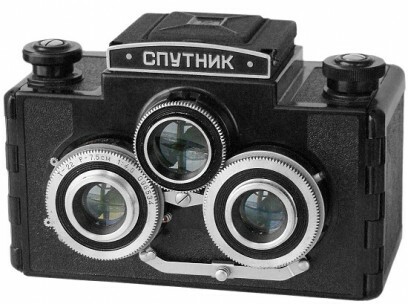 Waist lever finder "borrowed" from prototype "NEVA" TLR camera, dew design of T-35 lens. 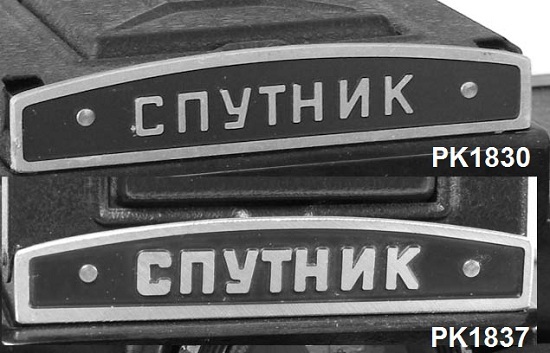 Different styles of nameplate can be found. 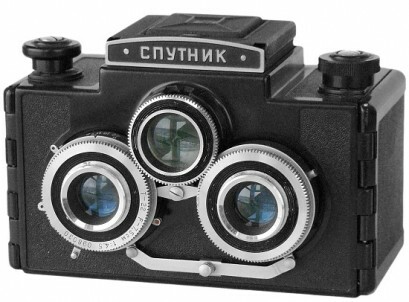 Very few cameras are known to exist in collections. 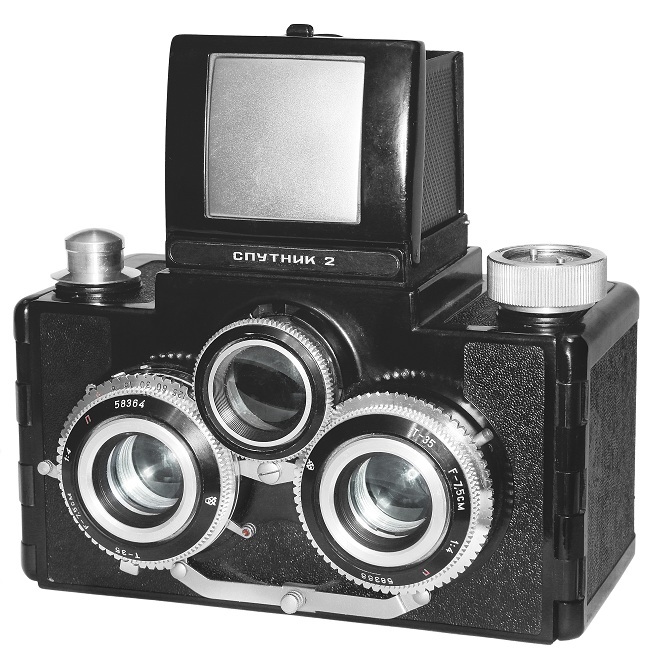 An ultra rare and expensive camera. 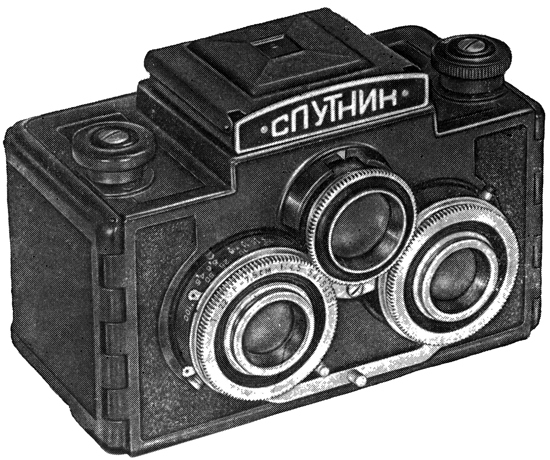 The picture of camera opposite taken from "The Authentic Guide to Russian and Soviet Cameras" by J.L.Princelle, 2nd edition, 2004. The particular picture was repaired a little bit, since camera on the book had wrong film rewind knob on it (from Lubitel-166). Replaced film rewind knob reminds an authentic knob now. 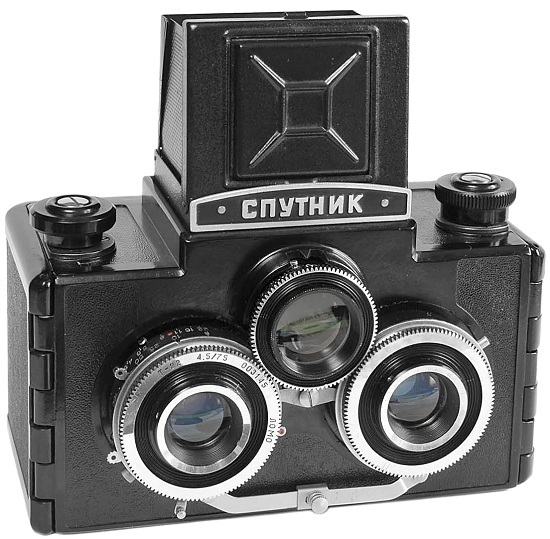 PK1875 - Sputnik-2 prototype camera. PK1875 - Sputnik-2 prototype camera from private collection in Russia.